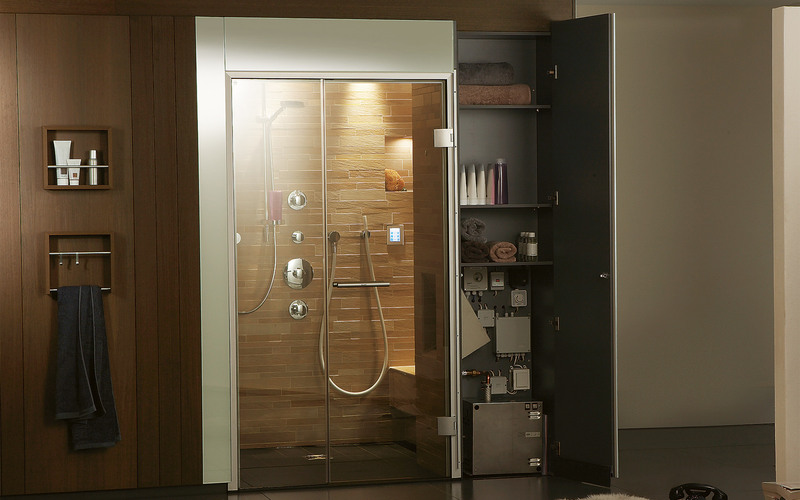 KLAFS steam showers: maximum indulgence and minimum space requirements. Minimum space requirements, maximum indulgence. Because KLAFS steam showers have succeeded in packing maximum indulgence into minimum space requirements. By combining the shower with the steam room, you can now follow a relaxing steam bath with a refreshing shower. A space-saving cupboard has been integrated for the vaporiser system. The temperature can be adjusted up to 48° C.
Glass mosaic tiles, porcelain stoneware or natural stone – be as creative as you like. Thanks to the fact that the generator takes up so little room, you’ll have plenty of space to play with. Whether you want to cool down after the sauna, or really get your blood circulation going. The Valley steam shower blends harmoniously with your bathroom, can accommodate up to two people comfortably, and offers bespoke designs for an amazing steam shower experience. On request, Valley steam showers by KLAFS are also available with hinged wooden seats, an illuminated recess and RAINMAKER. The cabin is made of lightweight moisture-proof elements, and surfaces are tiled with luxury glass mosaic or stoneware tiles. The technology is cleverly concealed in an integrated cupboard. The Valley steam shower with RAINMAKER and illuminated recess. Cool off with the Kneipp hose. The QUADRANO steam shower is made from sheets of sturdy, low-maintenance acrylic glass in a sophisticated white, and features a wide, ergonomically-friendly seating area and a luxury hand-held shower attachment. The floor consists of a shower tray with integrated drainage, meaning the steam shower can easily be fitted into any bathroom. The QUADRANO steam inlet recess also houses an aroma system. The sky is the limit when it comes to colours for your MOSAIK steam shower by KLAFS – you’ll be totally spoilt for choice. Which colour will you choose for your new steam shower? 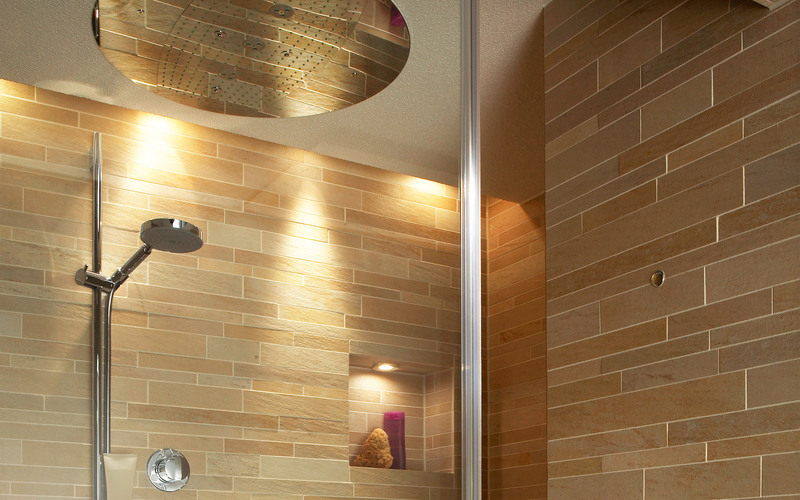 Create a highlight in your bathroom with a MOSAIK steam shower. With an illuminated shelf and touchscreen controls. Shower and steam room in one cabin. Space-saving vaporiser technology in an integrated recess. Bespoke hand-held shower attachment with shower rail and single lever mixer tap. Touchscreen to control cabin functions. KLAFS steam showers not only look stunning and feel great. The quality is bespoke, and they also feature state-of-the-art technology. For those of you with a technical turn of mind, let’s go into detail. Technical specifications for our steam showers: Shell made of lightweight moisture-proof elements, reinforced on both sides with fibreglass and a cement coating. Tiled surface with luxury glass mosaic or stoneware tiles. Plastered ceiling with moisture-proof spray plaster, painted white. Bespoke hand-held shower attachment with shower rail and single lever mixer tap. Electrically heated seating area. Steam inlet recess with stainless steel grating and aroma bowl. Steam-proof low-voltage ceiling spots with transformer. Vaporiser technology: Steam generator with nichrome heating elements. Casing made of corrosion-resistant material, steam cylinder and nichrome heating element made of stainless steel, automatic water level control in steam cylinder. The vaporiser can be connected to any domestic water mains.